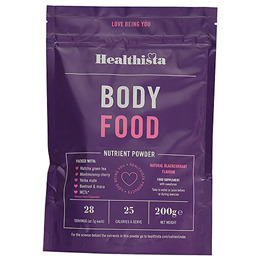 Healthista Body Food has been formulated to deliver a range of nutrients from botanical foods such as maca and green tea. Body Food contains ingredients that help to benefit metabolism and muscle recovery. The good news is, unlike most ‘superfood’ powders, it tastes great thanks to the natural blackcurrant flavour it contains. Coconut water powder, maltodextrin; raspberry (Rubus idaeus) fruit powder; medium chain triglycerides (stabilizer: glucose syrup, milk protein, citric acid esters of mono and diglycerides of fatty acids); flavouring: maltodextrin, gum Arabic, sweetener (Stevia), glycerin triacetate, flavouring: natural blackcurrant flavouring sweetened with stevia; red beetroot (Beta vulgaris powder, anticaking agent: silicon dioxide; strawberry (Fragaria ananassa) fruit powder; Montmorency cherry (Prunus cerasus) powder; Matcha green tea (Camellia sinensis) powder; Maca (Lepidium meyenii Walp) powder; white kidney bean ( Phaseolus vulgaris) standardised powder; blueberry (Vaccinium uliginosum) juice powder; baobab (Adansonia digitata) fruit pulp powder; Yerba mate ( Ilex paraguariensis) leaf extract powder; green coffee (Coffea arabica) standardised bean extract powder; black pepper (Piper nigrum) fruit extract powder. Take one scoop (7g) or one heaped teaspoon daily in a little water or juice, before or during exercise. Do not exceed the recommended daily intake. Store in a cool, dry place out of sunlight and out of reach of young children. Contains caffeine (2mg per daily intake). Not recommended during pregnancy. 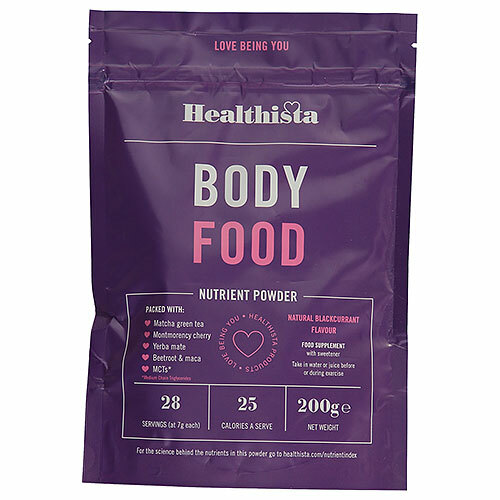 Below are reviews of Healthista Body Food Nutrient Powder - 200g by bodykind customers. If you have tried this product we'd love to hear what you think so please leave a review.